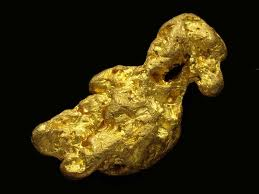 Gold is a precious metal found in the ground ,in rocks and in water. Gold is the only known yellow metal in the world. Gold is very expensive and very rare. From different countries thousands of people came to America, Australia and to many other countries to seek their fortune in finding gold. Small amounts of gold was found in New South Wales in the early days of colonisation, But the authorities kept it quiet. 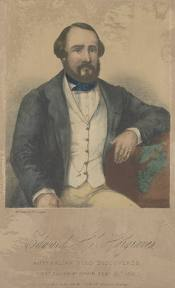 Edward Hargraves found gold near Bathurst and the word quickly was let out to everyone. Within a week their were 400 miners digging for gold near Bathurst. 4 months later there was up to 2000 miners had flocked to the gold field, which they named Ophir which in the bible meant a city of gold. So it was that the Australian gold rush had begun. Between 1851 and 1861 a third of the worlds gold came from Australia. By the century's end Australia was the worlds largest producer of gold. Holtermann's Nugget was found. 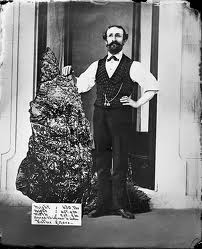 It was the worlds largest specimen of reef gold in that time. It was 286 kg in weight. The Hand of Faith, the Welcome Stranger and the Welcome are also very large nuggets. The news of the Australian gold rush reached China. Many Chinese that went to Australia were poor, so they would borrow money from someone to come to dig for gold, then they would pay the person back. The Chinese stayed together in groups which each had a head of the group. All of them had different jobs like mining, planting and cooking for the group. Lots of the alluvial gold had run out. The Chinese preferred not to dig deep under ground for they feared it would offend the mountain gods. The Chinese made money in other ways like selling their vegetables that they grew, selling pre cooked food and selling herbal medicines. The Chinese people , customs and culture were very different and strange to the European miners. The other miners were suspicious of them and thought their ways of mining were odd. Many Europeans were racist to them because of their pigtails and strange clothing, because they sometimes walked bare footed, that they balanced loads on two bamboo poles and their religion made them a target. Local Chinese towns came to be to tell newly arrived Chinese how to fit in.